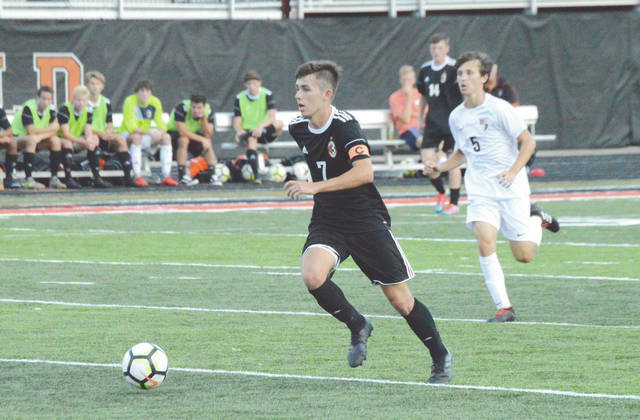 Senior midfielder Jonah Ackerson (7) scored the game’s only goal in defending state champion Beavercreek’s 1-0 home win Aug. 21 over Lebanon at Frank Zink Field in Beavercreek. Beavercreek senior midfielder Ryan Wightman tries to get off a shot with seven minutes left in the first half of Tuesday’s boys high school varsity soccer opening game at Beavercreek’s Frank Zink Field. Lebanon freshman goalie Kirk Rodgers snuffed the scoring try against the right post for the save. 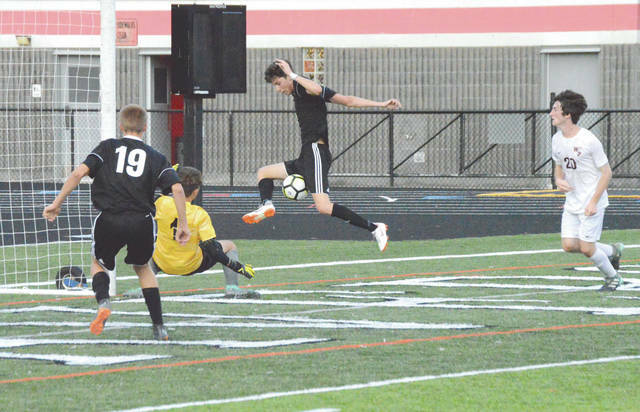 BEAVERCREEK — The defending Division I state champion Beavercreek High School boys varsity soccer team opened up the 2018 season with a 1-0 home win Aug. 21 on Frank Zink Field. Working with a new lineup and plenty of new cogs in the Beavers soccer machine, one goal was all they really needed. Jonah Ackerson punched in an unassisted score from close range with 14:30 left to play in the first half, and the Beavers offense controlled play the rest of the way to nab the win. Coach John Guiliano said the win felt like a season opener, full of plenty of things to work on for his talented team. Guiliano brushed off talk of his players lugging a giant bulls eye on their backs, being the defending state champs and all. “Everybody wants to say they beat the defending state champions, but it’s a different situation. That team’s gone. This team’s gotta find its identity, and the kids have gotta find their roles and responsibilities,” Guiliano said. 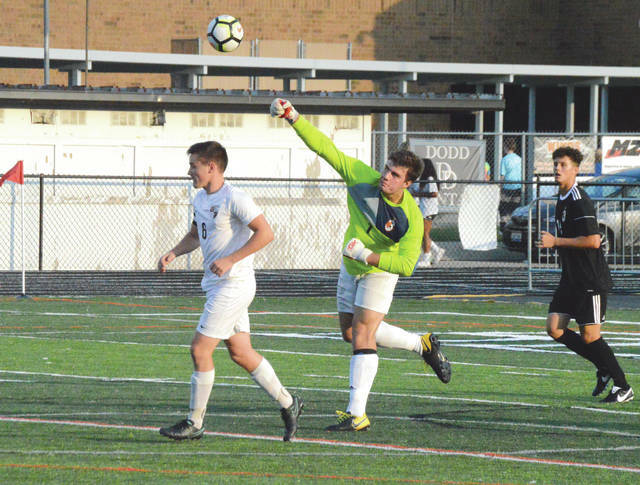 Back on Nov. 11, 2017, Beavercreek needed two overtime periods before defeating Medina, 1-0 for the school’s first boys state soccer title. They finished the season with an undefeated 22-0-2 record, and so not only are the Beavers the defending state champs, but they’re running up an impressive streak of matches without a loss as well. Their last loss came on Nov. 9, 2016 in the regionals against eventual state champion Columbus St. Charles, a team which beat Beavercreek twice that season. Moeller is the last non-St. Charles team to beat Beavercreek before that, and that also came deep in the post season, a 2-1 overtime match on Nov. 4, 2015. Lebanon coach Steve Jaynes said the match might not have been as close as the scoreboard had indicated. Jaynes applauded Lebanon freshman goalie Kirk Rodgers’ match play, especially in the second half. He said senior midfielders Grant Ingham and Zack Gemmer both played well, too. Beavercreek put plenty of pressure on the Warriors in the second half. They had nine corner kick chances in the second half, to none for the Warriors. Guiliano said Beavers goalie Garrett Arbogast played a nice game to get the shutout. “The guys did a decent job for their first game out. We’ll see how they feel tomorrow after they discover their bumps and bruises,” he added. Beavercreek (1-0) returns to Zink Field for its next match, a 7 p.m. Saturday, Aug. 25 non-league battle with Sycamore. Lebanon (1-1) also faces a Cincinnati school that day,they’ll host Wyoming at 3 p.m.